I went to Morocco for about a week in September 2013. I cannot describe all what I saw in one post, but this time I would like to share with you one of the things that I liked the most: food! So, what do people from Morocco eat? The truth is that they eat nice dishes. Moroccan cuisine has been influenced by several cultures including, but not limited to, Berber, Mediterranean, Middle Eastern, African, Portuguese, Spanish, and French gastronomy (1). 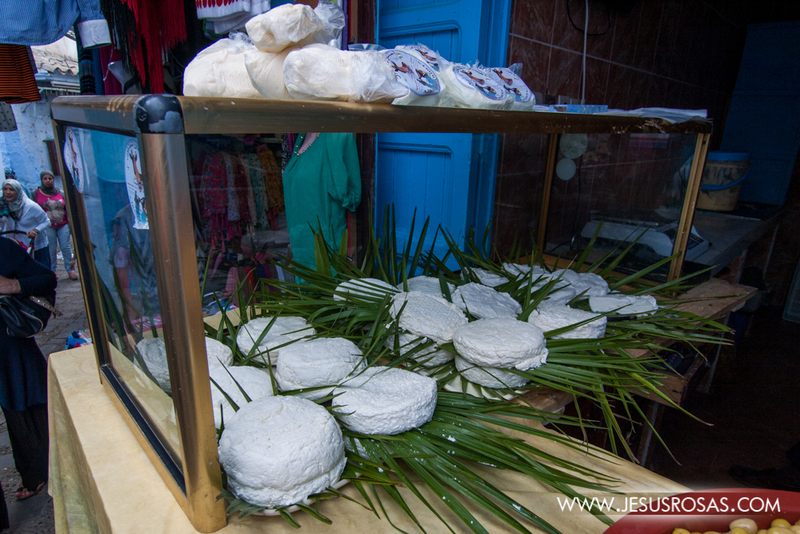 But I better show you some samples of the great variety that Moroccan cuisine has to offer. Some descriptions are at the bottom of each picture or set of pictures. Individual pictures can be enlarged if you click on them. The first dish I want to show you is chicken tajine (also spelled tagine). 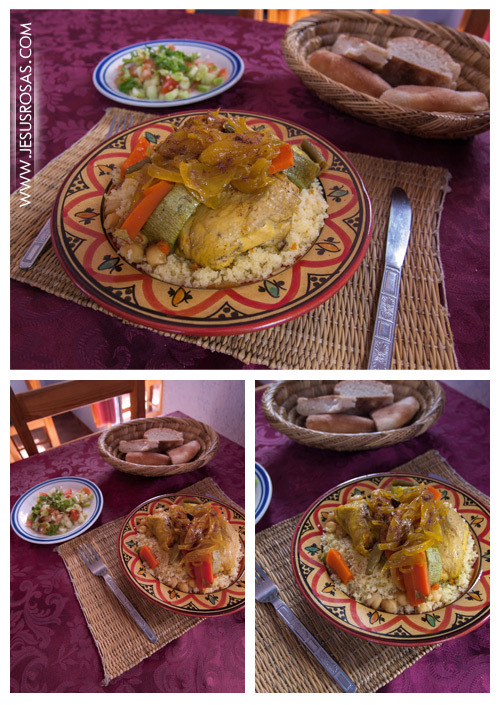 This may be the dish that I liked the most of Moroccan cuisine I tried while I was there. 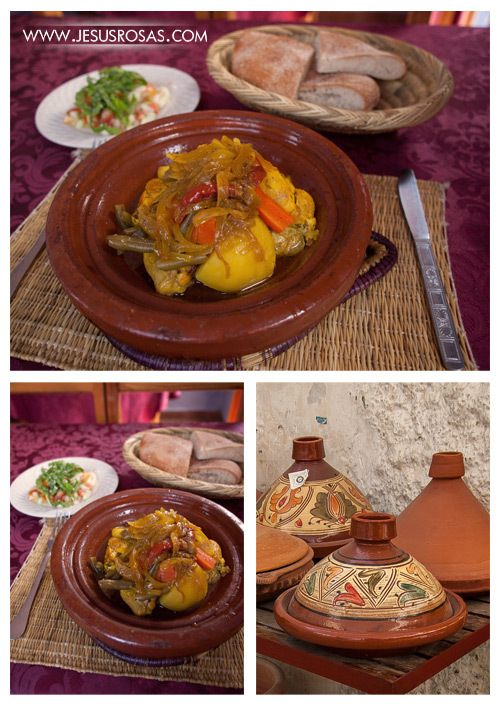 The term tajine is applied to both, container and dish. The container is made out of clay (see picture at the right side) and it is used as a slow cooker. The dish recipe may vary, main ingredients can be lamb, chicken, tuna fish, vegetables, etc. ; however, the thing that I liked the most is the sweet flavor in it. If you don’t like sweet and salt foods this dish may not like you. The dish can be sweetened with prunes, caramelized quince, preserved lemons, apricots, etc. The meat turn out very soft because of the slow cooking process. Tajine dishes are very popular in Morocco and you can find it everywhere there. I always saw many figs, dates and other fruits during mi walks through the streets of different cities in Morocco. Prickly pears (opuntia) were also very common. Something I enjoyed a lot was fresh cheese with a piece of bread and something sweet such as jam. These were some of the desserts I ate. Morocco has good pastry influenced by the French and the Middle Eastern flavors. Pastry with almonds and cinnamon were the ones I saw the most. 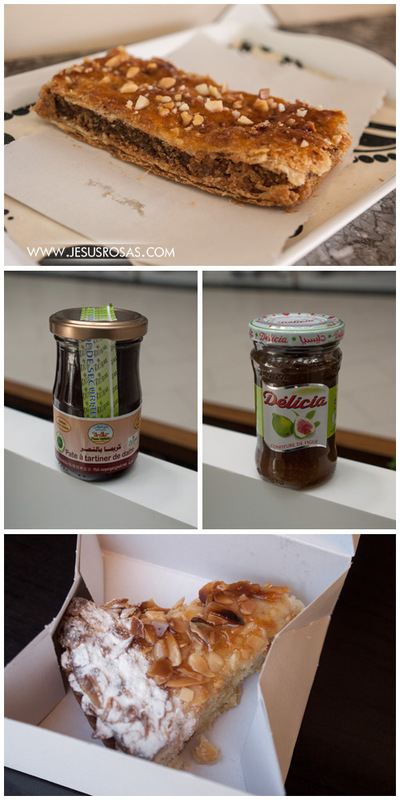 And about the pictures in the center, the one on the left is a type of paste or pate made with dates and peanuts. The one on the right is fig jam. 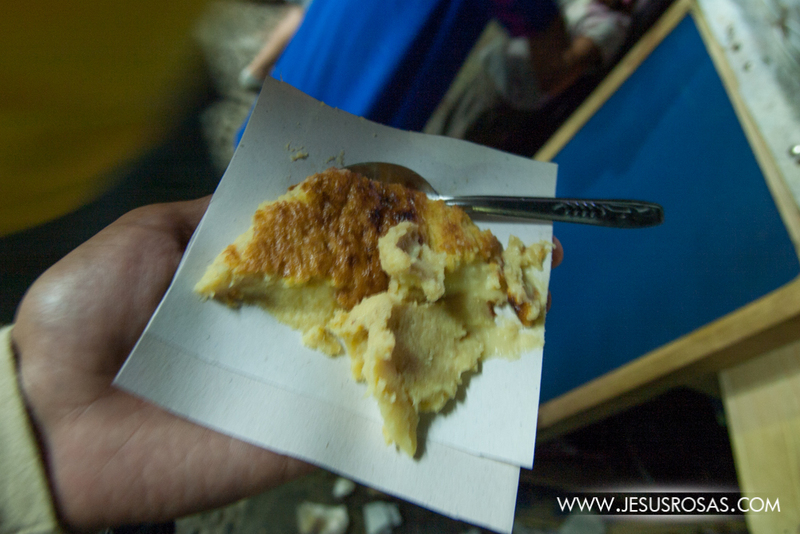 Another interesting dish was pastilla (also bastila, bastela, etc.). 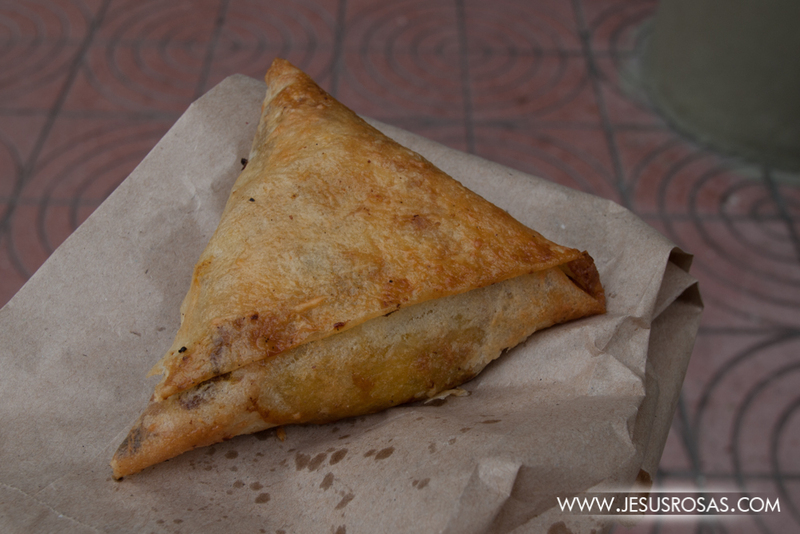 It is a squab or chicken meat pie. The meat is mixed with onions, parsley, almonds, cinnamon, and sugar. The wrapping is a thin and crisp layer of dough. Another sweet and salt dish that I like. I also found some other interesting things such as these “mash chickpeas.” The seller told me it was called “caliente” (meaning hot in Spanish). I saw this in Chefchaouen and seemed popular among the locals. 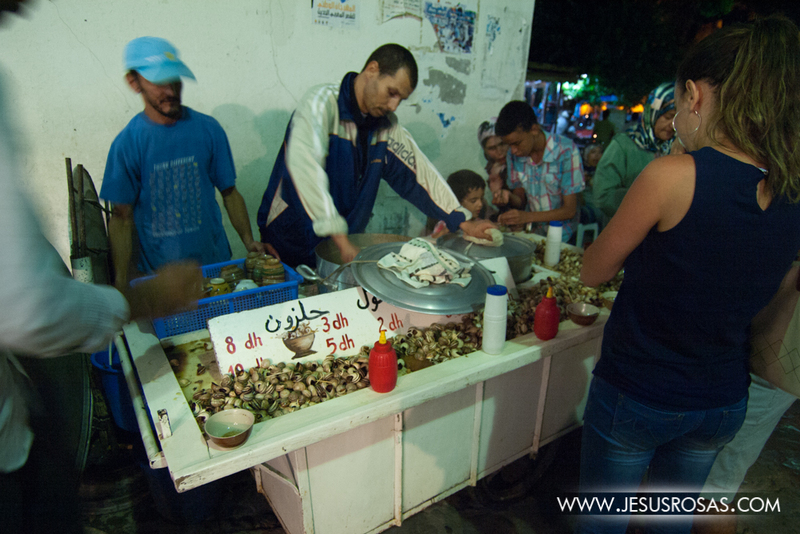 Right next to the “caliente” snack seller there was a stand selling snails. Another popular influence from the Middle East reaching as far as Morocco is shawarma. 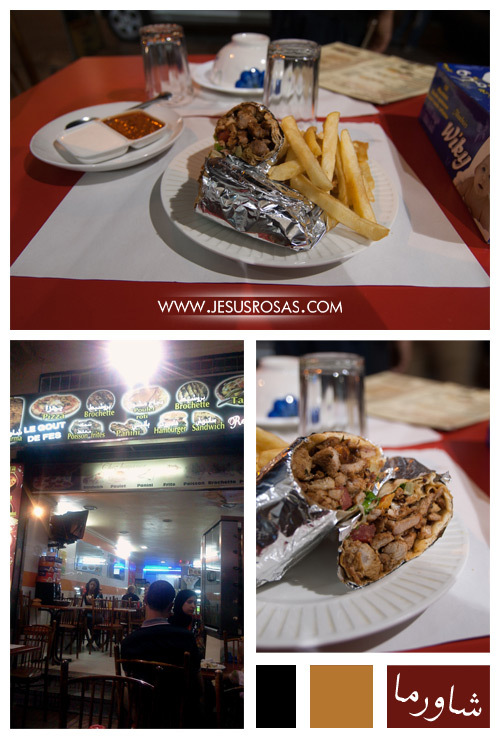 Shawarma is applied to both, the name of the dish and the way the meat is prepared. The meat can be from chicken, lamb, pork, etc. and it is placed on a spit to be grilled all day long. This reminded me of tacos al pastor in Mexico (cooked in the same way, but different marinating flavors). Shawarma also means the way the dish is presented, the meat in a flat and round piece of bread (like Indian, Greek, and Turkish pita bread) and folded like a taco, hotdog or sandwich. This also reminded me of percherones (a kind of burrito but larger) in Hermosillo, Sonora, Mexico. 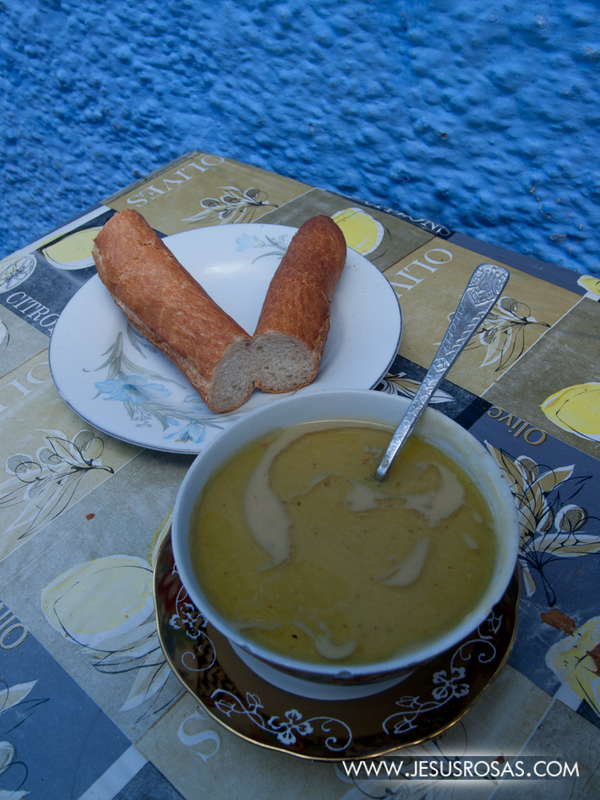 Talking about soups, another popular dish in Morocco is the harira. This soup is stronger than the bessara. 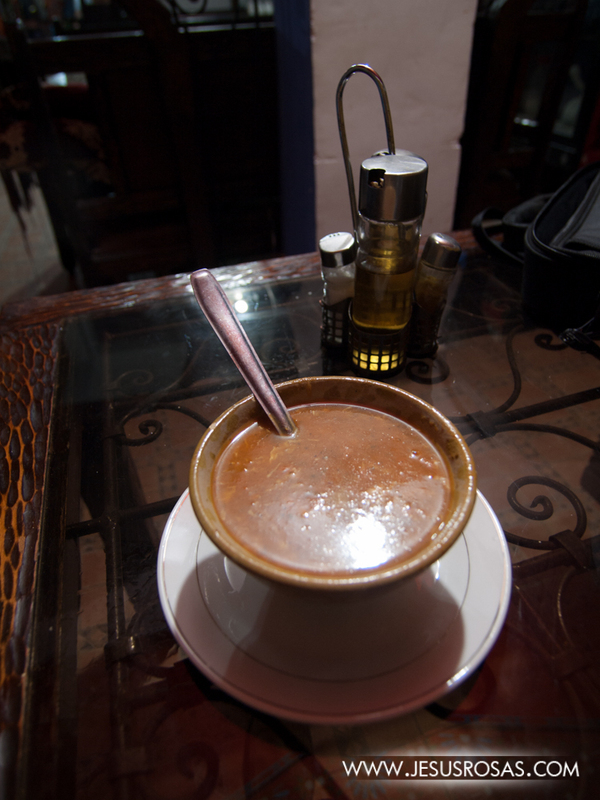 The harira is mainly made with tomatoes and a variety of ingredients according to the place. Some ingredients may be chickpeas, lentils, fava beans, pasta, etc. Spices may include ginger, paprika, turmeric, cumin, nutmeg, and others. 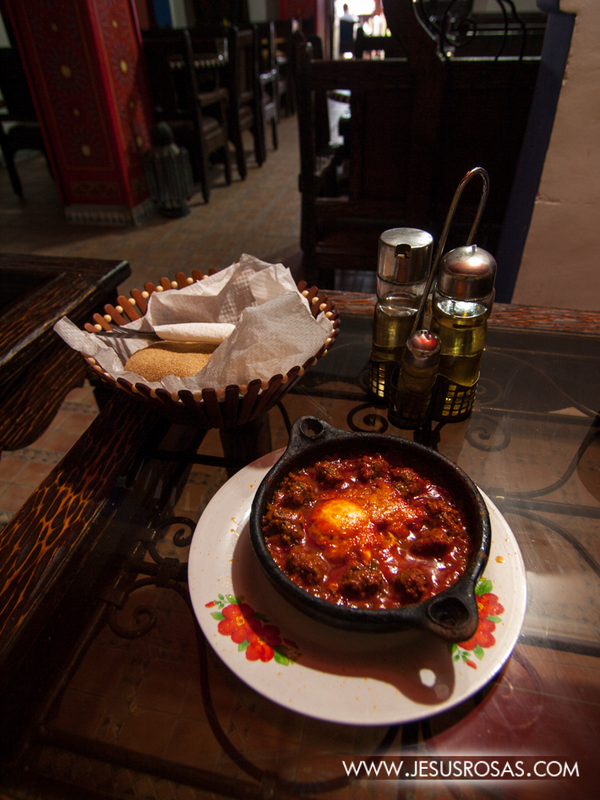 Also in the same restaurant I tried the harira, I had the Moroccan kefta with eggs. The kefta dish consists of meatballs with some onions and spices. In this case it had eggs and a type of tomato sauce. Not bad. 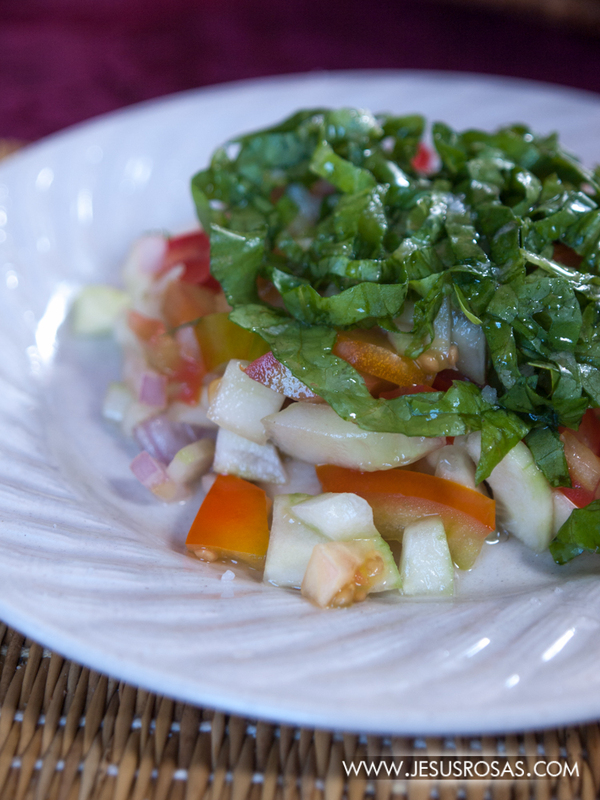 A Moroccan salad. Can you tell the ingredients? Besides what you can see there was a touch of lemon and salt. And to conclude, the Moroccan couscous. 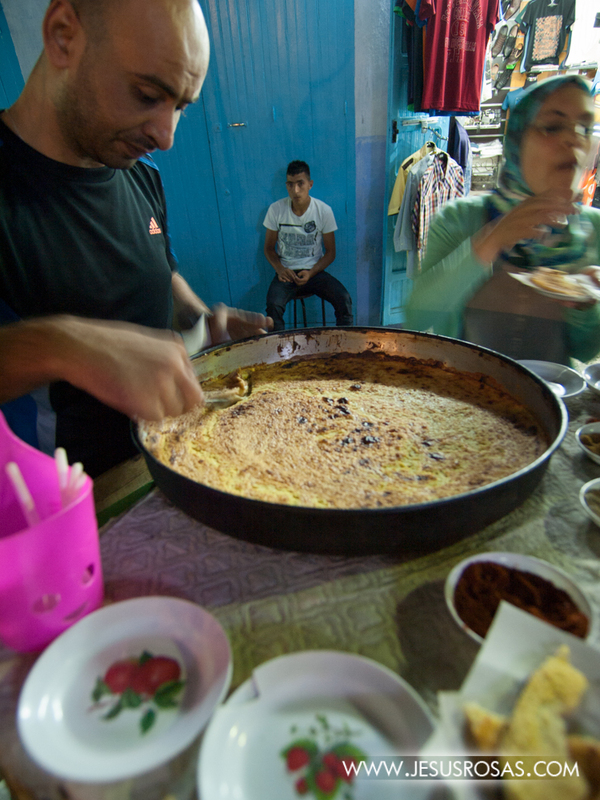 A very typical dish in Morocco. It is made from semolina. It is served with another main ingredient such as vegetables, chicken, lamb, etc. In this picture, you can see the chicken version. It looks like tajine, but it is not. Same restaurant and same salad though. “Moroccan Food.” Ifood.tv. ©2009 FutureToday Inc., n.d. Web. 18 Oct. 2013. <http://www.ifood.tv/network/moroccan>. 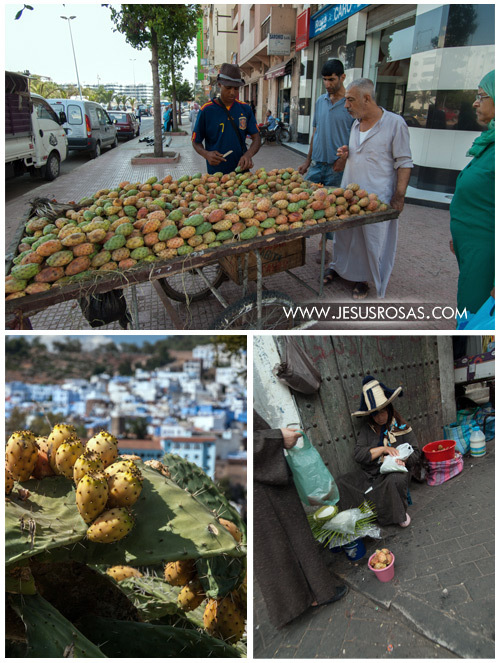 All pictures in this post were taken by Jesús Rosas in September 2013 in different cities of Morocco.